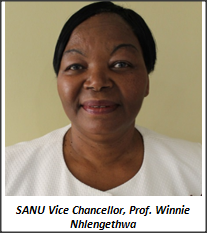 SANU Vice Chancellor, Professor Winnie Nhlengethwa has predicted that 2016 is going to be a challenging year in many fronts. The Vice Chancellor was speaking to the University Community when she released her statement on resumption of University business for on the 8th January 2016. Professor Nhlengethwa congratulated students and the rest of the University community for having tranquil holidays and said that resumption of University business meant hard work for all. Speaking on the economic challenges, Professor Nhlengethwa said it was still going to be hard for most of University community, including the students. She said that these challenges were evident in the sense that most students are struggling to pay their tuition fees, especially those who are self-sponsored. She said this was then going to affect University finances in a great way. She appealed to all who can sponsor the struggling students to assist. Professor Nhlengethwa says that SANU is committed to offering quality education and appreciate support from various stakeholders who continue to channel resources to the University to ensure that standards of education remain high at the regional University. Professor Nhlengethwa added that the current El Nino drought facing Southern Africa also adds on the pressures and challenges facing the region. She encouraged University Community to use resources they have sparingly, especially because nobody is sure when the drought will end. She said this will also further worsen the economic challenges as the region may see food prices soar, pushing inflation upwards. The Professor encouraged friends and relatives of students studying at University level to assist them with food as they needed energy to cope with their academic demands. The Vice Chancellor said it was evident that some students come to class hungry and thus cannot cope with their work. On academics, the Vice Chancellor reminded students that hard work is a main ingredient on the recipe for success. She said that students should set themselves academic goals and exert much effort to ensure that these goals are achieved. Professor Nhlengethwa ended her speech with a scriptural caution where she shared a verse from Exodus 23:1-2a and wished all students a successful semester.